While fingers 2-5 drop to the key using the quick flexors, the thumb’s flexor moves the thumb towards the palm. Moving the thumb down towards the key requires abduction, which moves the long fingers sideways. Abduction is inefficient for speed, and can also cause tension and injury (Sándor, 1981; Taubman Institute, 1995, see DVD 1). In Golandsky’s professional practice, the most successful way of achieving correct thumb movement is to move the thumb in the preparatory motion a little from the MCP joint (see below), in conjunction with forearm rotation. 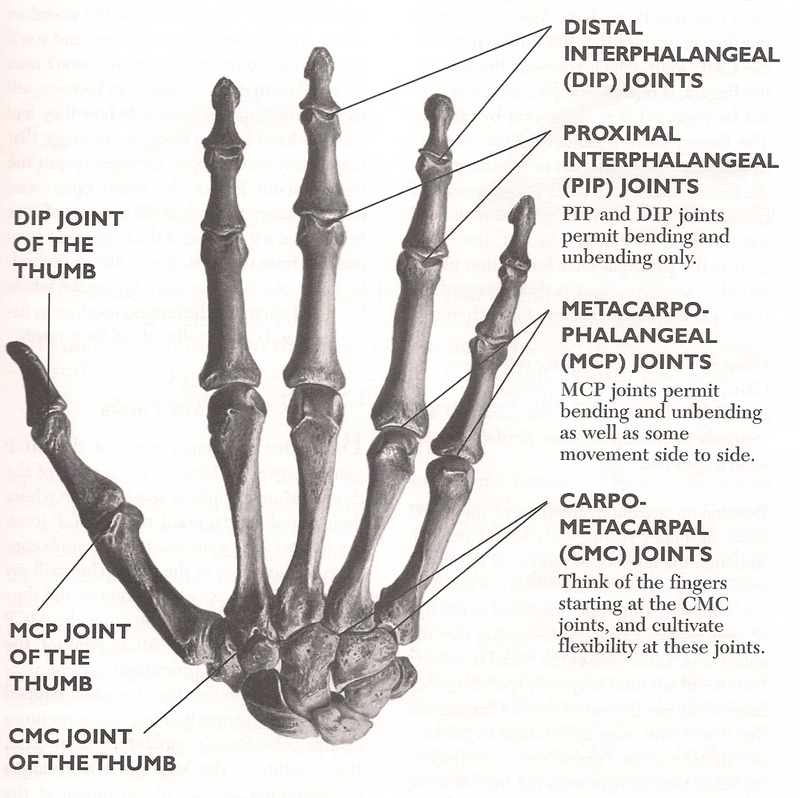 Structure of the Hand (Mark, 2003, p. 93). © 1998, 2000 by Benjamin J. Conable. Distributed by GIA Publications, Inc.
www.giamusic.com Used by permission. All rights reserved. However, the thumb has to be supported by the hand and arm in playing. For many students who habitually isolate the thumb, a helpful thought may be that the thumb plays “last” or “late” (Golandsky lessons, 2009-2010). Some pedagogues, such as Yankovitch, attack Taubman’s teaching of playing the thumb as “insidiously misguided and destructive”. They misconstrue that the thumb’s liveliness is eliminated, thus creating other problems (2011). However, when the technique is integrated, the thumb is not moved solely by forearm rotation (Golandsky Institute, 2009). Golandsky Institute. (2009). Teaching rotation: An in depth analysis of the key points and issues related to the teaching of rotation (Presented by Robert Durso) [DVD download]. New York: Golandsky Institute. Mark, T. (2003). What every pianist needs to know about the body: A manual for players of keyboard instruments: piano, organ, digital keyboard, harpsichord, clavichord. Chicago: GIA Publications. Sándor, G. (1981). On piano playing: Motion, sound, and expression. New York: Schirmer Books. Taubman Institute. (1995). Virtuosity in a box: The Taubman techniques. Musical examples and addenda, Volumes 1-5. [Score]. Medusa, NY: Taubman Institute.